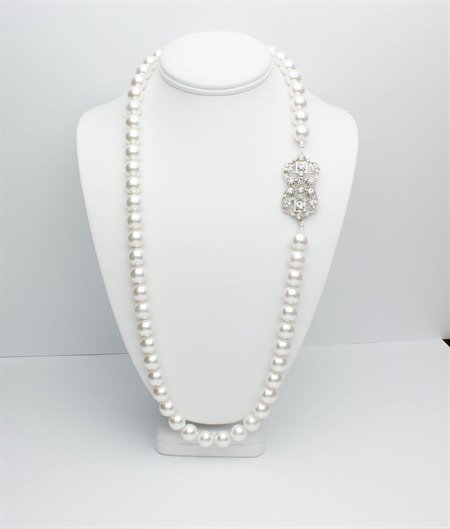 This beautiful Necklace has been designed using 12mm White Swarovski Crystal Pearls and a decorative vintage look antiqued-silver crystal 'hook and eye' clasp. The clasp measures 5cm closed. The clasp is very sturdy in construction and is held together by two very strong hooks and eyes which cannot be seen once the clasp is closed. The clasp can be worn at the back of the neck, or on one side at the front as a stunning feature. It was designed to be worn at the side. 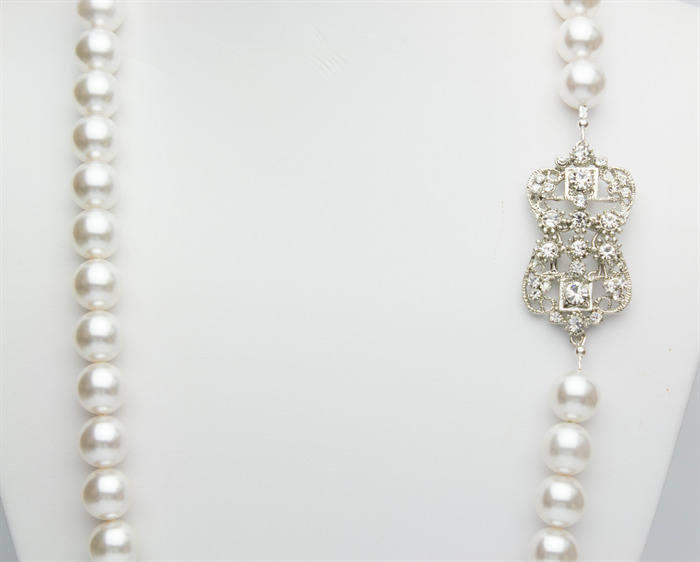 The necklace measures 76cm and is meant to be a dramatic statement Necklace showing the discerning taste of the wearer. This is a weighty piece at 165g. This is a top quality piece that has been created and finished to perfection. There isn't another Necklace like it in the world. Designed using 10mm White Swarovski Crystal Pearls with a top quality crystal and rhodium plated push-in clasp. It is suitable for a 17 - 17.5cm wrist and weighs 28g. The clasp is one of my very favourites that I use when possible, but only if the jewellery design calls for it. It is not available on the internet, nor in Australia. I have only found it in one tiny shop when I travel, so it is very special. The finish on it is rhodium plated, and the crystals inserted in it are stunning. 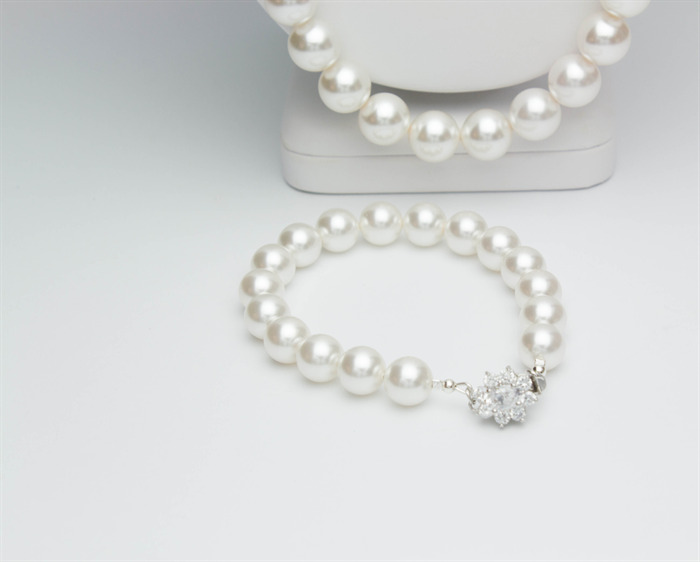 White Swarovski Crystal Pearls measuring 6mm and 8mm. The crystal components are all antiqued silver plated with 5 crystals in each. They measure 4.3cm from the bottom of the Sterling Silver hooks and weigh 3.7g each. 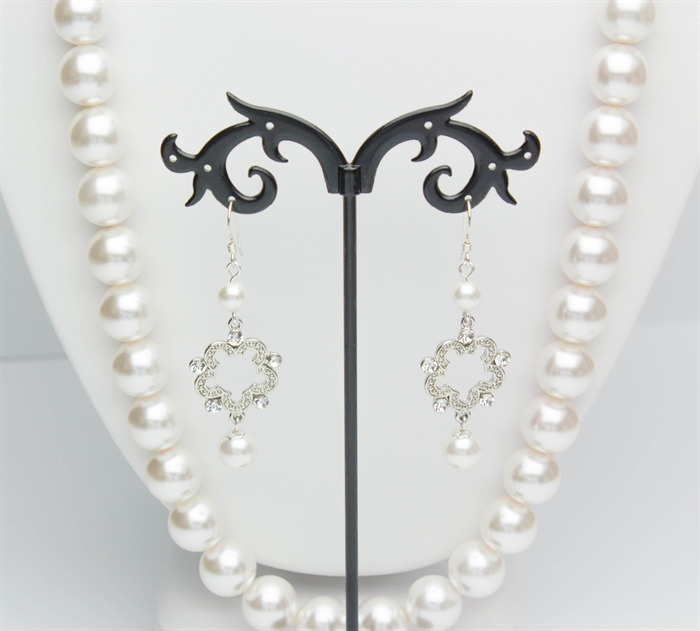 General - these are top quality pieces, with the clasps and earring components being selected by me when overseas. You will have something very special that is classy, classic and sophisticated. 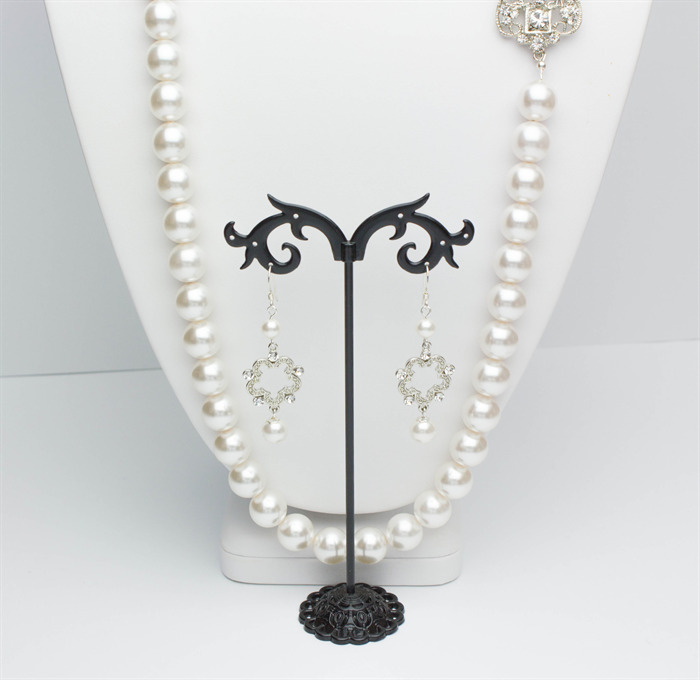 If you love "vintage look" jewellery, then this is indeed the set for you. The Necklace is ideal for wearing in professional offices, the board room, with an elegant suit or wherever you want to stand our wearing something no one else owns. This is an original one off design that will not be repeated, therefore you will not see your jewellery across the room on someone else, which makes it that much more special. I only accept payment via PayPal. Your item will ship within 3 business days of payment being received. Sincere thanks.